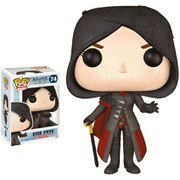 Assassin's Creed comes to you in Pop! Vinyl form! The Assassin's Creed Altair Pop! Vinyl Figure features the video game protagonist as a stylized vinyl figure measuring 3 3/4-inches tall. Collect all of the Assassin's Creed Funko Pop! Vinyl figures!